There were 453 press releases posted in the last 24 hours and 153,491 in the last 365 days. 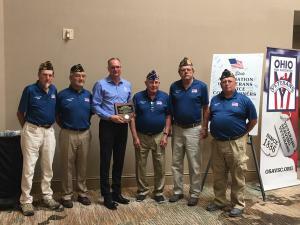 DEFIANCE, OH, UNITED STATES, July 30, 2018 /EINPresswire.com/ -- On Saturday, July 28th, 2018 at the quarterly meeting of the county veterans service commissioners in Columbus, OH, Bryan Keller, President & CEO of Keller Logistics Group, was honored with the Ohio State Association of County Veterans Service Commissioners Award; the first non-veteran, private citizen to earn it. Keller was nominated by Chris Newton of the Defiance County Veterans Service Commissioners because his work with Operation K.A.V.I.C. (Keller Assists Veterans In Crisis) and because his companies, Keller Logistics Group and affiliates, are one of the largest supporters of hiring veterans in Defiance County. Operation K.A.V.I.C. is a partnership between Keller Logistics Group, Defiance County Veterans Office, and Ravens Care and was created to prevent our local military and veteran personnel and their families from enduring financial hardship. Larry Moore, awards committee chairman for Ohio State Association of County Veterans Service Commissions stated, “When we look at individuals who go out of their way like this, we really appreciate it. Our president and officers feel it’s needed for someone who goes out of their way like this [to be] recognized and given a sincere thank you. Operation K.A.V.I.C gives us support we can call upon. It’s an outstanding effort on his part. I can’t say thank you enough for doing this since 2015”. This fund was founded in 2014 and began providing assistance in 2015 to veterans that live in Defiance County. Through the generous support of Keller Logistics Group’s suppliers and the Defiance community, Operation K.A.V.I.C. provides assistance with a wide range of expenses such as medical, shelter, and utilities and has even been able to help install railings at a veteran’s home and assistance in purchasing a therapy dog for a veteran. From January to the end of May of 2018, the Operation K.A.V.I.C. fund has provided $23,796 in assistance which impacted 167 Defiance County residents. Since it started in 2015, the fund has provided over $95,000 worth of assistance to area veterans and their families. Fundraising for 2019 has begun and will conclude with the 4th Annual Veterans Appreciation Dinner on Thursday, November 1st where Keller will announce the total amount raised for the year.